A.M.E.G. Designs : Lifestyle: When you feel like quitting..
Lifestyle: When you feel like quitting.. So here's the thing, keeping commitments to ourselves can be hard. We have the best intentions and the perfect picture in our heads of how it is "supposed" to go. The truth is some things are hard, because of habits that have been a part of our lives for sooooo long, to step in front of them can be tricky when they hold on to your left foot like tar. The best part is though, you did move that one foot, even just a little. And what does the mean??! It means you've got this for all the reasons you decided to move from habitual tendencies in the first place. Think about why you started, for your family and friends, to feel good, to be able to play with your nieces and nephews or daughters and sons, until you all fall on the floor laughing, (one of my favourite things of all time, just saying). To run with your dog so when you get home he's passed out in his bed well before its time to sleep. Those my friends are good moments! 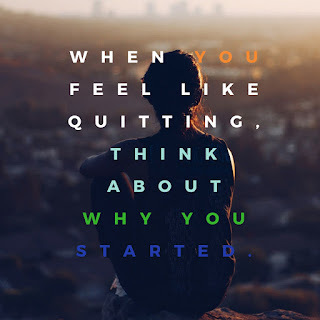 When you feel like quitting remember why you started, why you even had the thought to move forward. Because you are ready to stretch your wings and soar. Be easy with yourself my love and just pull that foot right out of what was never tar, but just a sticky piece of gum. I promise to continue to honour myself and share my journey. Even though my 40 day challenge of not over eating is complete, I will not quit, stop or hold myself back. I have never felt more clear and happy. Finally free! I've got this and so do you.